If you've watched the traffic in your neighborhood increase and are concerned about your family's safety, you may want to explore options to turn your neighborhood into a gated community. While some argue that these walled-off neighborhoods are elitist and anti-urban, others find they are an ideal solution to address their concerns. Check your local ordinances to see if it is possible to convert your existing neighborhood with public streets into a gated community. Find out what the law requires you to do. You will likely need to petition your neighbors, and a certain percentage (often 60 percent or more) will have to agree. Decide what level of security and amenities you want to create for your gated community. You can simply install a gate around the perimeter, requiring residents to type in a code for access or purchase an electronic gate opener. Some gated communities feature more advanced security controls such as motion sensors or armed guards. Some gated communities also include special amenities for residents such as a clubhouse, swimming pool or sports facilities. Decide if you plan to create a homeowners' association and if the membership will be voluntary or mandatory. Calculate how much each household would have to contribute for the upfront costs of the gate and other features as well as annual fees for maintenance. You should have a good idea of this amount before you present the idea to your neighbors. Present the idea of a gated community to a few of your neighbors. Before you make any drastic moves, informally poll neighbors you know to find out if they are open to the idea. You may choose to hold a neighborhood barbecue or potluck dinner to introduce the concept to your neighbors. 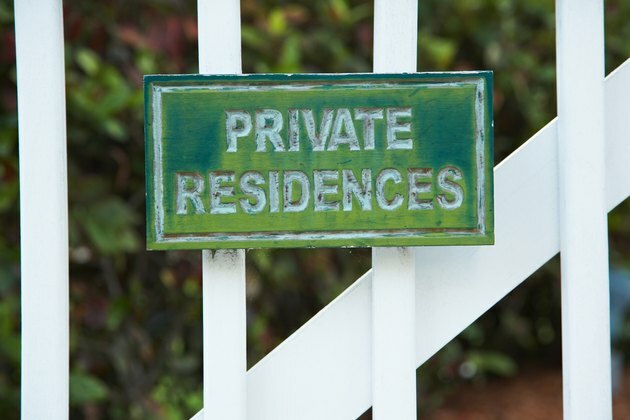 Explain the benefits of converting to a gated community and describe the process in detail. Retain the services of a real estate lawyer to make sure you are filing all necessary paperwork and ask for quotes from several vendors for the gate and security features.